In round three we have a battle of two Rye PAs, a hoppy style of beer that is similar to an IPA but with rye added to the malt bill. The rye imparts a spicy twist and helps dry out the finish. If you’re interested to find out more about rye beers check out a recent online article by Imbibe magazine. Now let’s meet our contenders. Wiley Wolverine Rye PA by Weasel Boy (Zanesville, OH) – Weasel Boy has been brewing beer in Zanesville since 2007. Prior to this event I had not sampled any of their beers, other than a small taste here and there at beer festivals. I’ve heard good things about their Anastasia Russian Imperial Stout and I look forward to trying that beer over the winter. 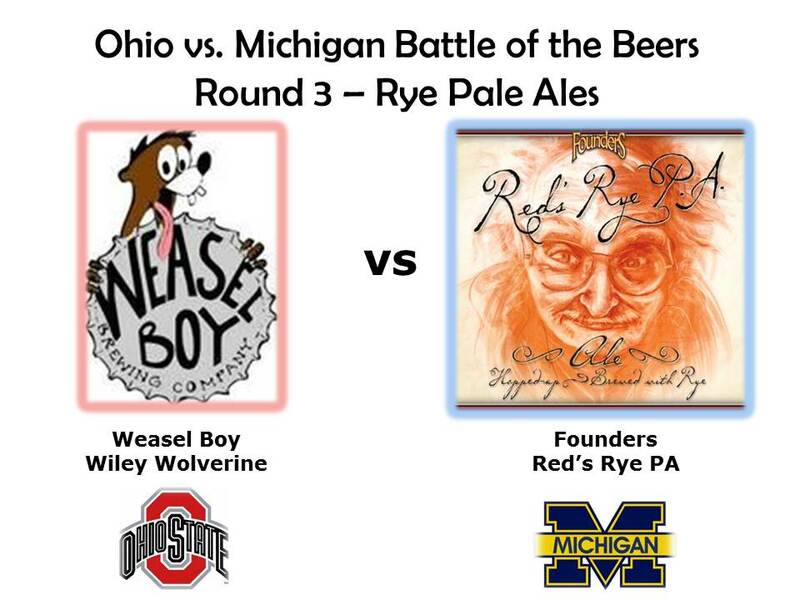 Wiley Wolverine ended up in this contest because I was looking for an Ohio beer to match up against Founders Red’s Rye PA. I was checking the Tap List at the Ohio Tap Room and I came across this beer. Not only is it an Ohio brewed Rye PA, but who could resist choosing a beer called Wiley Wolverine to represent Ohio (Editors Note: Many die hard Buckeye fans probably could resist that temptation without difficulty.) It is made with Centennial hops and checks in at 4.75% abv and 40 IBUs. Red’s Rye PA by Founders (Grand Rapids, MI) – This is a seasonal release by Founders. It’s made with four different varieties of imported Belgian caramel malts and dry hopped with Amarillo hops. On RateBeer.com it currently occupies the #2 spot on the top 50 list of specialty grain beers (most of which are Rye beers). So it enters the contest a decided favorite. It tips the scales at 6.6% abv and 70 IBUs. Before describing the beers I’m going to go off on a small tangent and describe the Ohio Taproom where as a first time customer I purchased the growler of Wiley Wolverine. It’s located in a small building in Grandview near the intersection of 3rd Avenue and Northwest Boulevard. 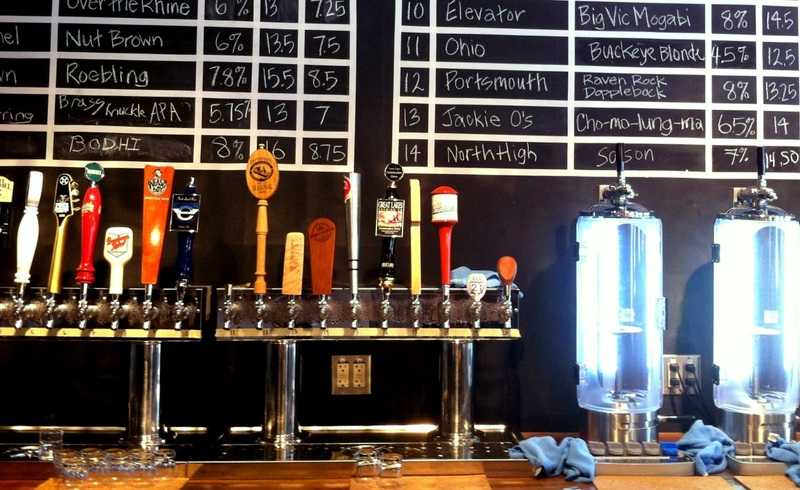 They typically have 20 beers on tap, all from Ohio breweries, and most of the beers on offer are not bottled. Looking at their current tap list I see they have beers from several Cincinnati breweries I’ve been wanting to try, including Rhinegeist, Blank Slate, and MadTree. They have Jackie O’s, Weasel Boy, Buckeye Lake, Hoof Hearted and draft only offerings from Fatheads and Great Lakes. I’d say over half of their tap list are beers I can’t find at other Growler shops around town. They also fill the growlers with in a special futuristic looking, Russian imported, tap system (see picture above). The chamber is flushed with a mixture of CO2 and N2 before filling to keep oxygen out of the growler. There are also some blue neon-type lights whose purpose is unknown (to me), but do make it look like something out of Blade Runner. The man who helped me at OTR claimed that because of this system the beer would keep in the growler for up to 3 months if you don’t open it. I’m not sure why you would purchase a growler and then keep it for three months, but its nice to know there is no rush to drink it. I should also point out that I purchased the Ohio beer shirt I’m wearing in the videos at the Ohio Tap Room. I plan to make many return visits to this gem. The Wiley Wolverine is a hazy, golden colored beer. It has a hop-malt balance that reminds me more of an English style IPA than an American style IPA. Having said that I will note that Centennial hops (an American hop and a one found in many, many American IPAs) are used in Wiley Wolverine. There are some nice bright citrus flavors in the background and the more prominent malt character gives it a bit of sweetness. As expected the rye imparts some spiciness on the finish, and together with the Centennial hops keeps it from being too sweet. It’s a well-crafted, fairly unique beer that I would be happy to try again. Red’s Rye PA is a darker beer, deep reddish-amber in color. The Founders website calls it crimson. It gives off a nice big citrus/pine aroma. It has the aroma and hop profile of a west coast IPA and the hop/malt balance of a good English IPA. It is a fantastically well balanced beer that gets high marks from me for both the malts and the hops. The rye gives it a spicy twist at the finish. This is an impressive beer, one that I will return to. I’d very much like to see what a fresh batch tastes like. I’ll be looking forward to the 2014 release of this beer in January. There is an interesting juxtaposition here. The Michigan beer takes on the OSU color scheme (minus the gray) while the Ohio Beer takes its name from the Michigan mascot. At the tasting party I voted for a tie based on the fact that Wiley Wolverine an English style IPA made with Rye, a combination that struck me as being pretty unusual. However, I revisited both beers the next day and I have to say I was wrong. Red’s Rye PA is an exceptionally good beer, and a fresh batch would likely be even tastier, it’s my pick for the winner of this round. The Wiley Wolverine, while good, doesn’t have what it takes to hang with the Red’s. See the video above for the people’s pick. These beers went over much better than the Belgian styles in round 2. In fact my friend Tom, who joins me for the video shoot, was effusive about the Red’s Rye PA. We have a definite winner here, with both the crowd and myself picking the same way for the first time in the contest.